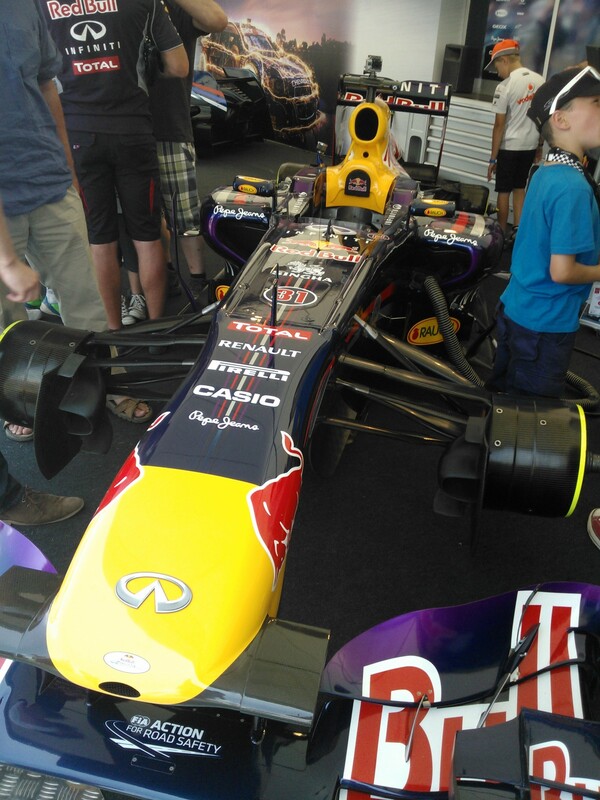 On show at the Red Bull Racing stand at Goodwood Festival of Speed 2013 was a car that I simply could not believe they would actually put out on display. Every other Formula One team at Goodwood had either brought a show-car, with no parts relevant to the actual race cars they use during the F1 season, or a basic launch version of a race car that was at least three years old. So when I took one glance at the Red Bull stand I thought it was just another show car. But I was wrong. In fact I was very wrong. Because right in the open for all to see behind a barrier of blue rope and silver posts was the RB7, the team’s 2011 double World Championship winner by some margin. This car was the first car to extract the full potential of the Exhaust Blown Diffuser (EBD) concept, pioneered by Adrian Newey and his army of technically gifted staff. At this point the two friends who I went with were also in awe of the fact that, as far as we could tell, this was the genuine car. Not just a launch version. Because we had a keen eye, however, we did spot a few differences. The car was designed to do show runs (hence why it was at Goodwood) so there were extra cooling gills along the sidepods to cope with longer stationary times and extreme driving (doughnuts, power slides etc. ), as well as various mounts for GoPro onboard cameras. Other than that it was identical. As we stood gazing at the Blue Beast, one of the on-hand mechanics asked if we wanted to come see it up close. I could not believe my luck, so I hopped over the blue chord and went straight for the front wing to get a closer look. With that done out came my phone and I started taking some pictures. At the time I thought I had taken a lot but it turns out I was too busy just looking around it. It is incredible to view the precision of any racing car when you are right beside it but an F1 car is another thing entirely. Above you can see a Bird’s Eye view of the endplate and outboard section of the front wing. What struck me first was how much bigger the cascades and canards are than they appear on TV. They aren’t a lot bigger, just bigger than I imagined them to be in terms of chord length (distance from leading to trailing edge). I have highlighted the four elements utilised in this wing to give you an understanding as to what Red Bull are trying to achieve. 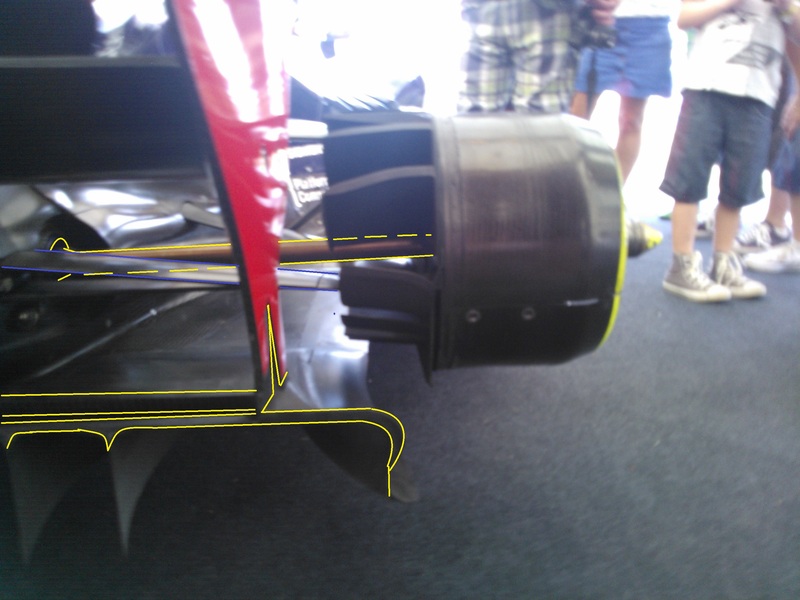 Unlike a conventional wing, each plane of the wing (highlighted by the yellow lines) does not simply attach to the endplate. The planes curve at 90 degrees as they reach the endplate area before joining at the footplate, the black piece of carbon fibre that the endplate is mounted to. This allows each plane to overlap eachother as you can see above, slowly stacking layer after layer to form a smooth, continuously building gradient. By doing this with four elements it reduces the tendency for airflow detachment, producing consistent downforce across a wide range of airflow speeds. This method may not produce the maximum downforce possible but it gives the driver confidence in the front end of the car. This fanning out of the elements as they reach the trailing edge of the wing also aids airflow around the front tyre to reduce drag. All of the above parts highlighted on the wing also help airflow around the front tyre, specifically to a desired region to feed components downstream such as the sidepods and the side of the floor. At the centre of the image, the elongated blue and exposed metal piece is the Front Flap Adjust (FFA) system. Even this piece has been designed in such a way to aid the aerodynamics of the car. The circled stay at the right of the image stops the two elements joining together under loading, a legal requirement by the FIA. If the two planes joined together, the airflow on the underside of the wing would detach due to the loss of high energy flow being introduced into the gap between the elements. This stalls the wing causing a reduction in downforce and also in drag, increasing the top speed of the car. On the very tip of the trailing edge of the endplate I have highlighted a lipped piece. This is angled against the oncoming airflow to splay it outwards and right around the front tyre in a bid to feed non-turbulent airflow to the components aft of the tyre. If we look at the cascade and additional winglet, both of these two pieces are dual elements designs. On the main cascade trailing edge I have highlighted a small gurney flap. This gurney flap increases the high pressure on the top side of the cascade which in turn reduces the low pressure area beneath it. Although traditionally these winglets are designed to manage airflow around the front tyre they do produce a small amount of downforce by themselves. Such is the detail of these components that we can also see how the fences between the cascade and its twin winglet are shaped in an aerofoil. Also, the canard above the main cascade also helps manage airflow. 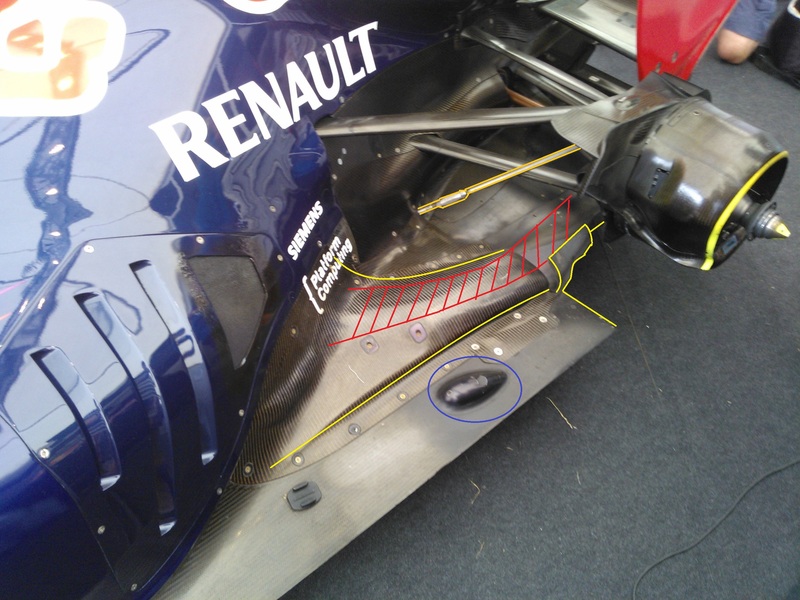 This canard has little-to-no gradient change across its chord therefore it is only to straighten out and direct oncoming airflow to the rest of the car. In yellow I have highlighted two things, the first being the carbon fibre vanes that entice air into the hub and cool the brakes. The heat from the brakes dissipates into the core of the tyre above so it is important to cool the brakes correctly in that aspect as well as ensuring that they also remain within their operating window. The yellow circle shows a basic temperature sticker on the brake caliper. The sticker lets the mechanics taking the wheel off of the car after a run see instantly what the brake temperature is which can be useful in a number of ways. This allows mechanics to get to work instantly by either adding duct tape to the brake ducts (if the brakes are too cool) or removing bodywork from the hub assembly (if they’re too hot). That’s what I think it’s used for, anyway. To extract the vast amount of heat build up inside the hub, the whole assembly opens out towards the wheel face. I have marked the fences that guide this hot air out in blue. These fences allow the air to pass correctly out of the assembly and into the tyre wake outside. What we are now seeing on this year’s cars are inboard extraction vents that exit inside of the front wheel behind the brake duct entrance, kind of like a cooling circuit. This mainly reduces drag because the hot air, is not being fired straight into a large volume of already turbulent airflow that is the tyre wake. This would cause a larger vortex of air as the two different densities of airflow combine. Finally, the orange circle at the centre of the hub shows the wheel nut. The nut in the image is not fully fastened into place as the pins that lie on the axle to stop the nut from flying off are still being covered by it. Moving round to the sidepod and exhaust area, we can see the EBD in the flesh. You can also see the removable panel which has been fitted with additional louvres to extract heat from the car due to the longer stationary times that show cars undergo during an event. There was also a GoPro camera mount on the floor of the car. Let’s break down what is happening here. The long carbon shrouding is an aerodynamic cover for the exhaust pipe that extends right to the edge of the floor, exiting next to the rear tyre. The pipe is actually split in two to splay the exhaust gases in slightly different directions. To the right of the exit lies a curved fence, similar to what Mercedes have on their car this year, to keep the gases running along the side of the rear tyre. As the fence ends the floor suddenly cuts inwards, releasing the high energy gases into the gap between the rear tyre and the edge of the floor. This effectively seals off the gap, reducing tyre squirt – this is the turbulence that the sidewalls and shoulders eject off the tyre. This is different to tyre wake as squirt is the outward projection of turbulent airflow rather than turbulence behind the tyre. Reducing tyre squirt increases the efficiency of the diffuser as the turbulence cannot impinge on the low pressure flow beneath as much. Of course there is still a small amount of this going on as the diffuser will never be totally efficient in producing downforce, but the EBD increases the efficiency dramatically. Allowing the diffuser to work better creates a more downforce. 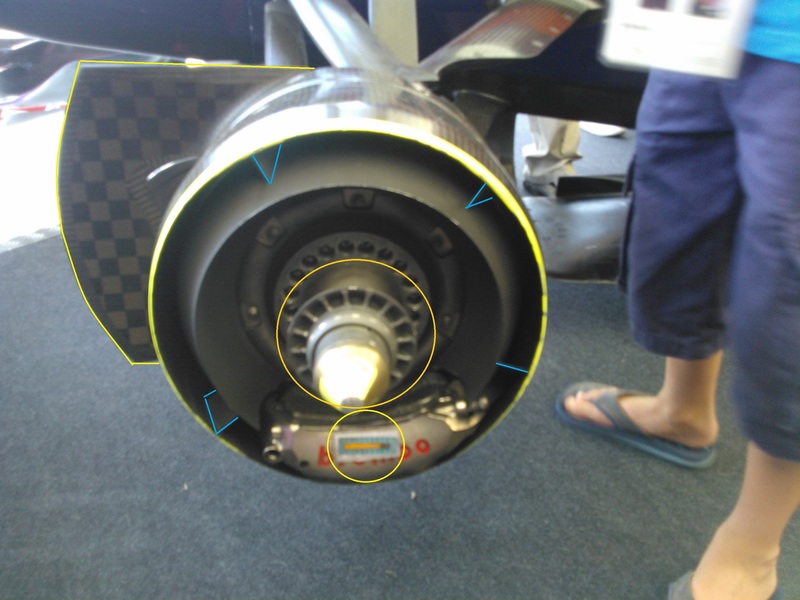 The blue circle shows the infrared (IR) sensor that looks back at the rear tyre, analysing the surface temperature which is fed back over the telemetry feed to the pitwall. I am not sure if this is compulsory but all the teams have it on the car. In orange is the pullrod arm that Red Bull re-introduced into F1 in 2009. In 2011 they continued with this as it allows more airflow to pass through to the critical aerodynamic components such as the beam wing and the top of the diffuser. In the image above is an unfortunately blurry looking rear brake duct. 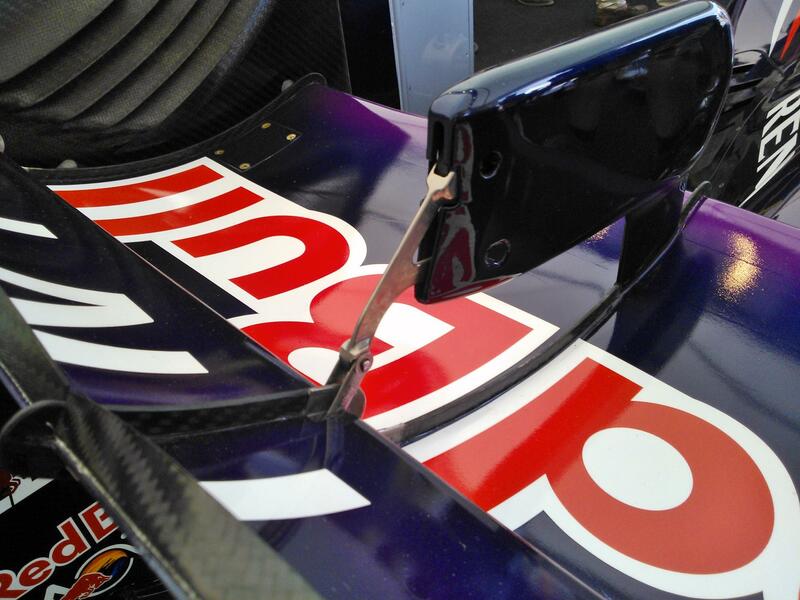 The flick-ups on the inboard side produce local downforce directly to the wheel, forcing it into the track. You can also see the various canards and lumps on the top of the brake duct vane, which help manage tyre wake as well as providing efficient cooling to the rear brakes. Next up, the Drag Reduction System (DRS). I had never seen any images of the DRS up close until now, so it was a good opportunity to see how it all worked. Above is the hinge mechanism that the top flap is mounted on so it can open and close. What the hinge mechanism creates is a gap between the flap and the endplate of roughly 15mm, leaving room for the aerodynamicists to fill it with another wing element. What we can also establish from this image is that the endplates are much thicker than anticipated, but start to thin out as they stretch towards the back of the car at their trailing edge. This was the best quality image I took, and at this point the Red Bull staff were not too happy with me. This picture shows the actuator attached to a central hinge on the top flap. The actuator is hydraulically activated when the DRS button on the steering wheel is pressed, pushing the exposed arm upwards. The pressure within the system is fairly high as it has to cope with a lot of loading from the airflow coming onto the wing. As the driver touches the brake pedal before the corner the system is deactivated and the hydraulic pressure is released completely. The flap drops down to its original position under the load of the airflow so the system does not require a two way system for activation and deactivation. The actuator spans the entire length of the main plane chord and its housing is shaped as thinly as possible to reduce drag. 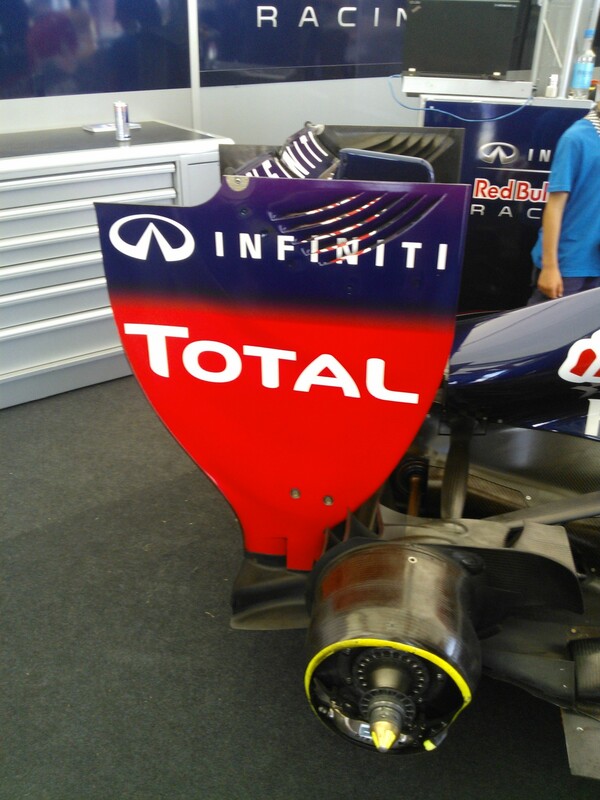 We can also see the large gurney flap that lines the top flap to increase downforce. In the background of the image we can see the gills on the endplate. These gills even out the pressure delta between the two sides of the endplate. This is done to reduce the turbulence at the wing tips where the two pressure zones collide, which causes drag. We can often see these vortices in damp conditions. Look out for this at Spa in a month’s time as it is often wet and these can appear in cool conditions. Let’s take a look at the diffuser first. The double layer of yellow lines at the top of the diffuser shows the gurney flap that runs across the top and joins where the rear wing endplate meets the floor, however the gurney now has a gap beneath it rather than being attached to the top of the diffuser. It works in a similar way to that when it is placed on an aerofoil by encouraging low pressure to flow even quicker out of the floor below. 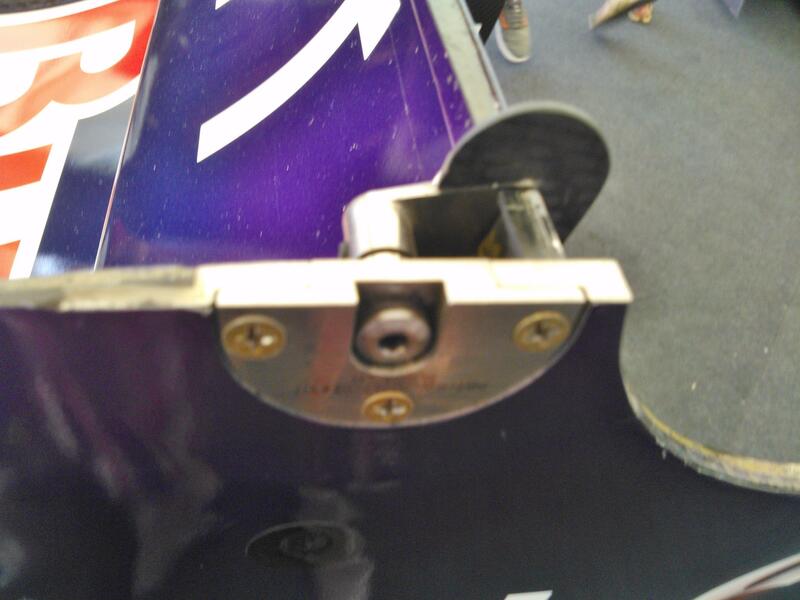 On the outboard edge of the diffuser is a joined gurney that does not have a gap beneath it. This splays airflow outwards and also encourages the floor to work harder. 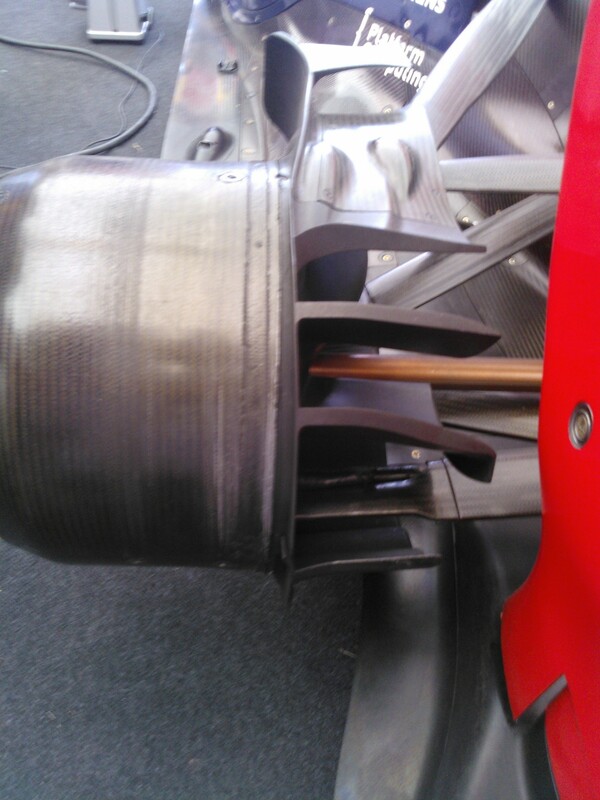 At the top of the diffuser fences, they tend to curve off rather than join at 90 degrees. 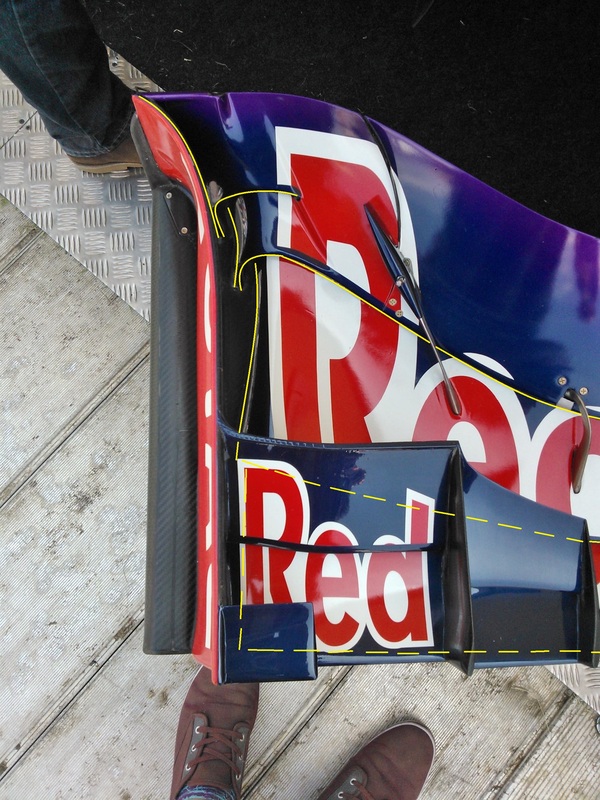 At the base of the rear wing endplate it is split to allow flow on the inside of the ‘plate to travel to the other side. This could be to do with pressure build up along the inside of the endplate that restricts the downstream gurney flap’s working capabilities. Moving onto the suspension area, the yellow line (dotted when not visible) highlights the driveshaft. The indigo coloured line shows the lower wishbone assembly and beneath this is the track rod. A lot of progression has gone on in this area over the past two years, as teams now place the track rod and driveshaft all inside an elongated lower wishbone to reduce drag. The driveshaft’s spinning motion causes drag by the Magnus effect – low pressure builds up at the top, high pressure at the bottom, creating lift and also turbulence aft of the shaft. Housing all of these components in an aerofoil shape also cleans up airflow going over the top of the diffuser downstream. This was the final image I managed to take before the mechanics kicked me out… Literally! I don’t know why the wanted me to leave as it was all on show for the public to see. Maybe I was taking too many pictures in the more sensitive areas of the car for their liking. This shows the whole endplate assembly and the rear brake duct/hub. I hope you enjoyed this short insight into a modern F1 car. 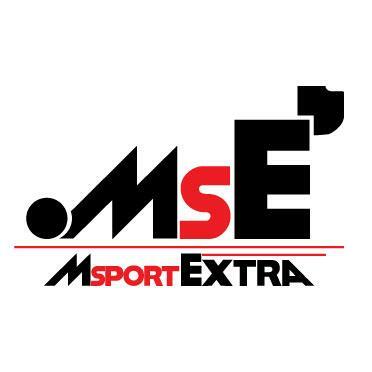 Sorry for the sometimes blurry images, blame the phone for that one… If you have any feedback please leave it in the comments below. Cheers! This entry was posted in Analysis, Special/Other on July 31, 2013 by thewptformula. Well done Will! Reading your stuff is like reading Scarbs’ early stuff a few years ago! Keep up the great work and I’m sure you’ll build a big following. That’s about as good a compliment as they come! Cheers, there’s lots more to come from myself, too.